A sudden and unexpected breakdown meant that I was in the market for a new ½" router. Whilst looking for a suitably powerful machine, I saw the Triton. It looked "different" enough to bear closer examination and after some consideration I left the store and the Triton came with me! This router has a number of unique features. Even if you are familiar with routers, please read this manual to make sure you get the full benefits of the unique design. Difficult though this was (with a gleaming new tool on the workbench! ), I suspected it might be good advice and it proved to be so. I spent twenty minutes or so with a cup of tea and the booklet, with the router in front of me for familiarisation. This was well worth the time spent, as I was then able to confidently switch between the different plunge modes, set the depth stop and attach the fence without any problem at all. All of these functions have really been well thought out and are impressive in both design and ease of execution. Here's an overview of the router, both front and rear views, with the main features numbered. 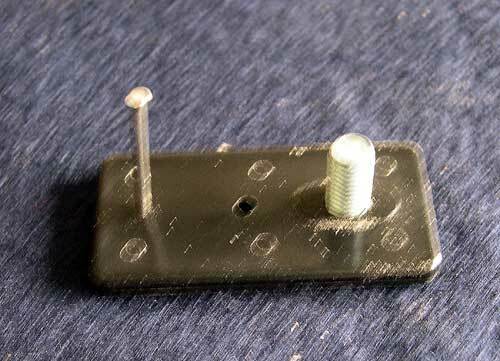 N.B: The wing nut on the metal baseplate is part of the trammel (compass) facility, described later. Fully enclosed safety shields (remain fitted when changing bits). Illuminated switch with shutter to prevent accidental starting. 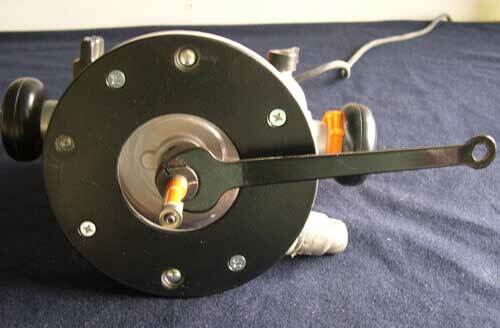 Powerful 3¼HP motor with soft start. Easy to set turret stops with direct reading calibrations. Multi-function fence. 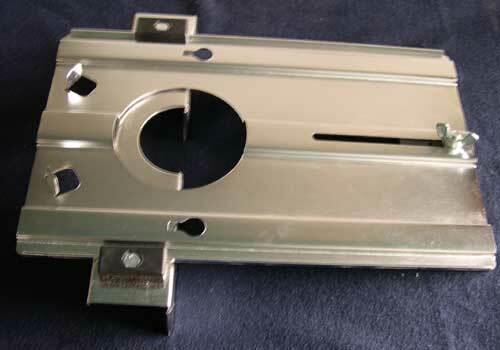 Incorporates extended baseplate and circle cutting features. Variable speed (8,000 to 20,000 rpm) with speed maintenance under load. Removable plunge spring reduces plunge resistence when table-mounted. Winder handle rack-and-pinion plunge for fast depth adjustment. Conversion switch for plunge or winder depth setting. Micro-winder for precise depth setting through the full range. Large bore dust port for effective chip extraction. 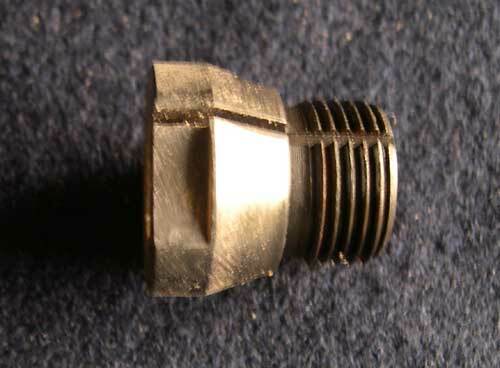 ½" collet (with ¼" reducer). Shaft lock automatically engages in cutter change mode. 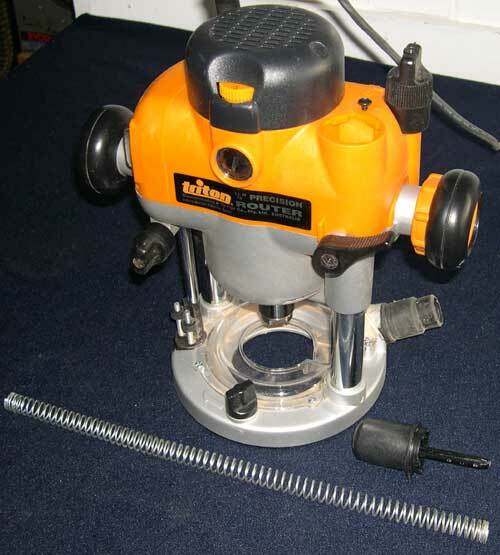 Triton ½" Premium TCT Router Bit included. This is a big machine, but not heavy for its size. Being designed for use in a router table (part of the Triton system), it has a couple of features that are particularly useful for table mounting. The first is that the plunge spring is easily removable, so that you don't have to fight the spring when trying to adjust the height. 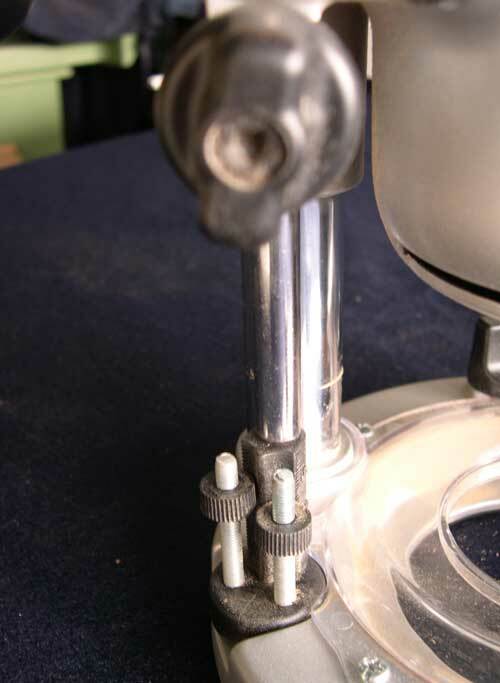 To remove the plunge spring you slacken the screw which secures the spring cap - located above the right-hand column - then carefully turn the cap anti-clockwise (about an eighth of a turn to release the bayonet fitting), making sure to keep downward pressure to hold the spring. Once the cap has cleared the fitting, you can slowly release the spring from its housing. 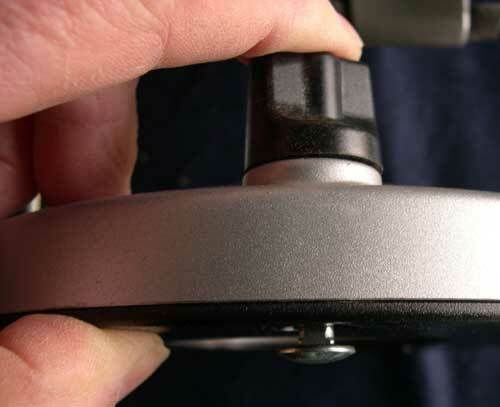 The cap has a central rod to prevent the top of the spring deforming when being replaced and it is a simple matter to return the spring and engage the bayonet fitting. Also visible is the dust extraction port, which has a left-hand thread of 38mm outside diameter (the adaptor fitted is mine). The second useful feature is that the plunge depth allows the collet to completely clear the router base when fully plunged, as shown here. This is especially useful for bit changing whilst mounted in a table, but is also useful for bit changing generally. When the router is fully plunged, the spindle lock automatically engages and the power switch is bypassed so that the machine cannot be operated, even accidentally. The router has a rack and pinion mechanism built into the right-hand column - rear view shown here. This enables the router height to be adjusted by turning the right-hand handle when using the rack and pinion. Whilst this may sound awkward, it really is simple and effective in use and when mounted in a router table it is particularly brilliant! The router can be wound up or down with ease, especially with the plunge spring removed. Also in this picture you can see the spindle lock cam protruding from the main body. As the router reaches its full plunge depth the cam is activated, which will engage the spindle lock in one of four indents in the rotor as soon as the main shaft is turned. 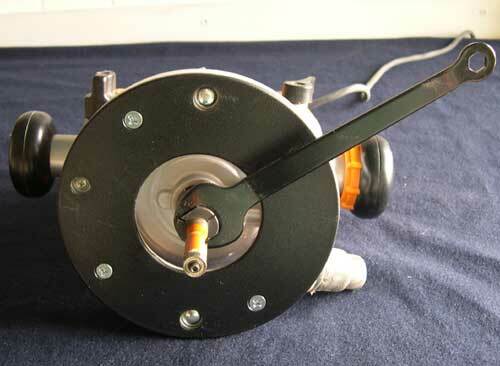 As stated previously, the power is by-passed when in this position, so there is no possibility of the motor being switched on with the spindle lock engaged. Both handles are round, smooth and easy to grip. 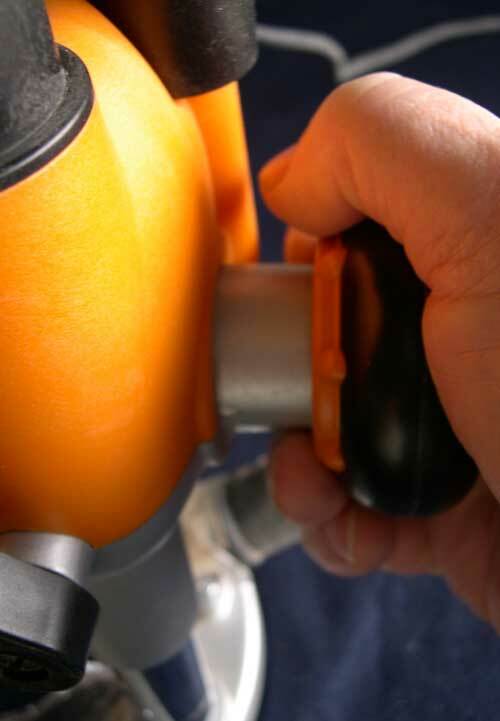 Here is an operator's view of the right-hand handle with the rack and pinion ring lock in the engaged position. This is the grip used to release the ring lock manually and turn the handle to raise or lower the router height. Once the desired height is reached, release the ring and the machine is locked at that height. The height adjustment has a number of "steps" throughout its range and these may not fall exactly at the height you require. 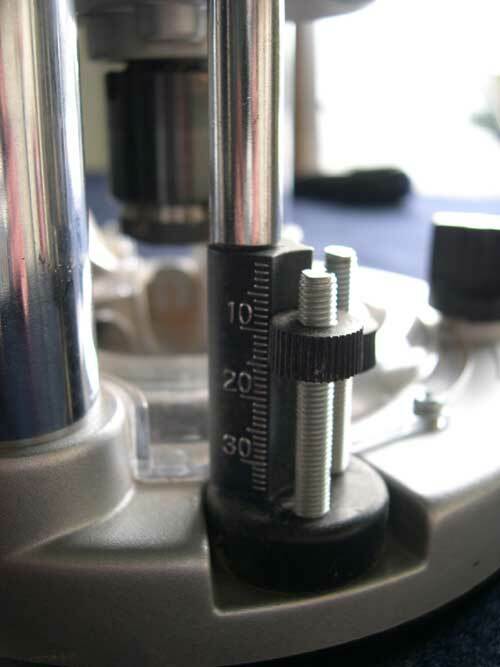 The micro-adjuster knob is used to set the height accurately and can be used at any of the "steps" when using the rack and pinion plunge method. This means that micro-adjustment is available over the full plunge depth, but without the need to "take up loads of slack" when plunged deeply. Also seen in this picture is the plunge spring cap release screw (in its unlocked position - the cap's bayonet fitting is holding the spring). Here is the plunge lock lever, easily reached by the operator's right thumb. 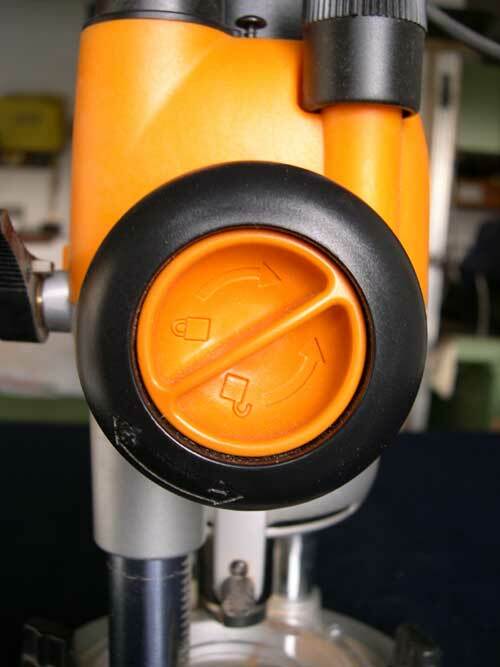 This is an extra lock when using the rack and pinion plunge method (recommended for heavy cuts). I have operated the machine without using it and the rack and pinion mechanism held totally secure. 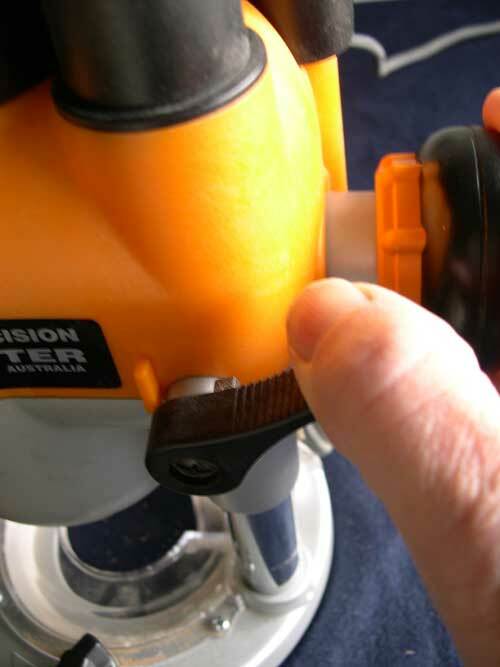 However, engaging the plunge lock lever is good practice, as it is possible to grip the right-hand handle ring lock when operating the router (although not a "natural" motion) and if this was squeezed too hard it could engage the rack and pinion. When used in a router table, the rack and pinion and the micro-adjuster set the height perfectly. The plunge lock lever in this situation is "belt and braces" when rounding over and profiling with small cutters, but I found myself using it (as best practice) when raising panels with a large bit. The lever is adjustable for operator comfort and preference. I left mine as it was when I unpacked it, as I find it ideal where it is. 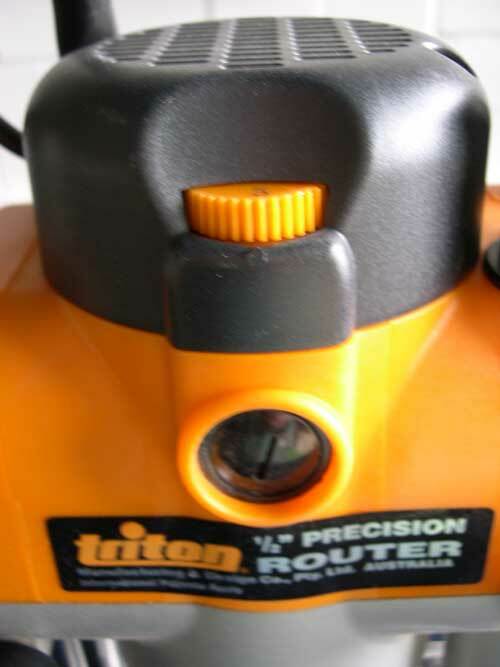 Having described the rack and pinion plunge method, together with its micro-adjuster, the Triton router also has a conventional free plunge action. This is operated by locking out the rack and pinion with the plunge mode selector, which is built into the end of the right-hand handle. To disengage the rack and pinion mode, the selector is turned in a clockwise direction, then pressed inwards and turned clockwise until it clicks in. Now the router is free to plunge conventionally, using the plunge lock lever to lock the height if desired. The plunge depth turret is also an ingenious design. 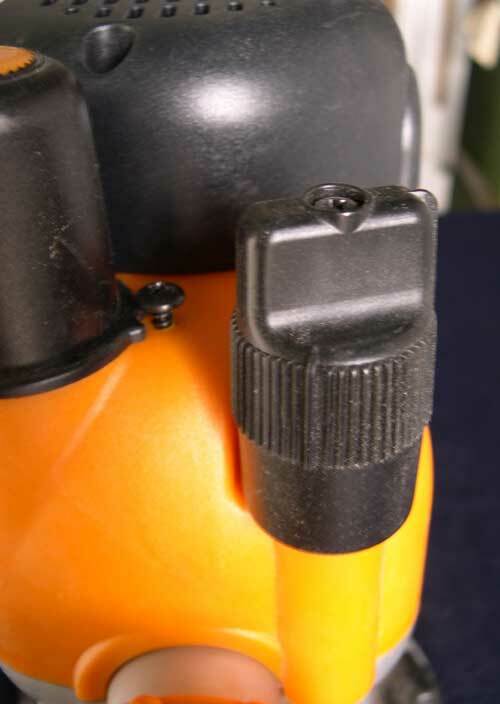 It consists of a sprung-loaded tube, controlled by a depth stop locking knob (out of focus in this picture - sorry!). The turret itself has two adjustable posts and one reference post (shown here with the plunge stop rod in contact with it). Suppose that you need to rout some 5mm holes for adjustable shelf pins, using a jig. Previously, I had to measure the jig thickness, add the depth of the hole (7mm) then set that depth on the turret by lowering an adjustable scale, then locking it. 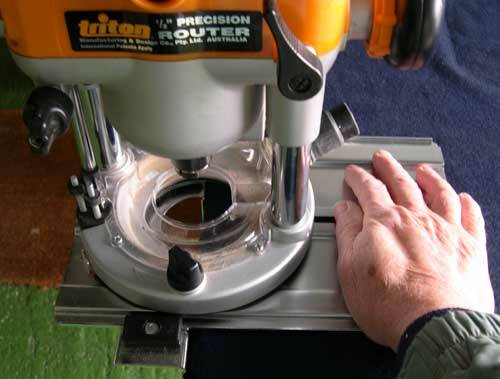 With the Triton, nothing could be simpler - I set up the jig, insert the router into position, loosen the locking knob and plunge the router until the cutter comes into contact with the workpiece. With the plunge stop rod in contact with the reference part of the turret, I lock the knob. Now I have a "zero datum" set, so I just need to rotate one of the two alternative adjustable turret post stops to my required plunge, in this case, to 7mm. Once I've done that, I rotate that post under the plunge stop rod and begin routing. Ingenious, effective and simple. Without reading the booklet before using the tool I might have spent a bit more time head-scratching, but as soon as I read it and looked at the way it worked, I was able to set it right first time and it's spot-on accurate too. Here's a closer look at the plunge depth stop turret. The plunge depth rod is in contact with the reference post section of the turret. You can see that there are two posts with adjustable thumbwheels, so you can set two different or alternative depths if you need to. The scales are easy to read and the measurements are accurate. 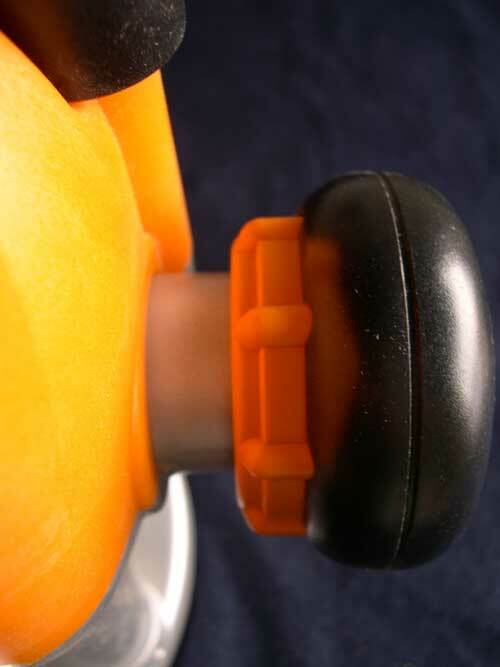 The turret pivots easily, but the indents hold each of the three positions firmly. The On/Off switch is robust, very safe and another example of thoughtful design. 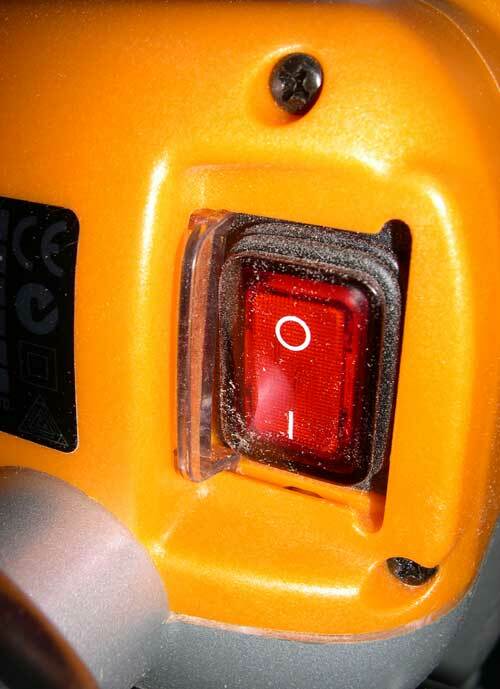 In the "Off" position, the switch is covered by a sliding shutter. 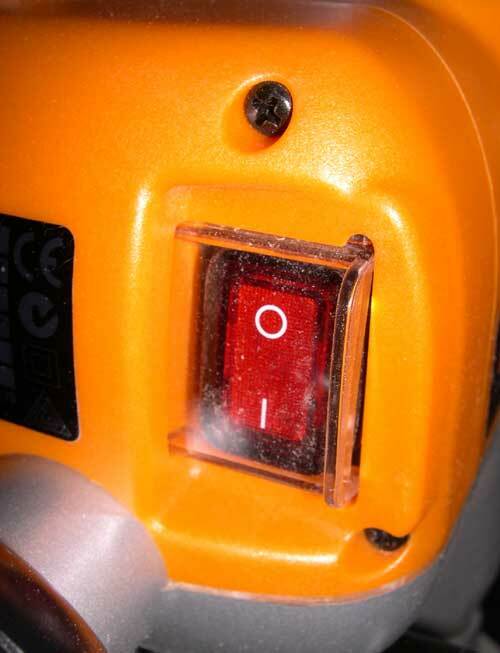 The shutter is see-through and the power switch illuminates (red) when power is connected - whether the switch is on or off. To operate the switch, slide the shutter towards the rear and depress the lower part of the rocker switch. This action rotates the upper part of the switch into the plane of the sliding shutter, thus keeping it open whilst the switch is on. As soon as the rocker switch is turned off, the sliding shutter returns to its safe covering position. The switch is locked out when the router is fully plunged in order to fit or remove a cutter. When using a router in a table, it is normal to switch power on and off via a remote switch. This is possible with the Triton, but there is another benefit to the switch design, because with the switch in the "On" position it is impossible to plunge the router into the cutter change position. Therefore, not only does the switch not allow the router to be switched on (even accidentally) when changing cutters, it will not allow an operator to get into the cutter change position when the switch is on - even though the power is off. Now that's what I call safe! 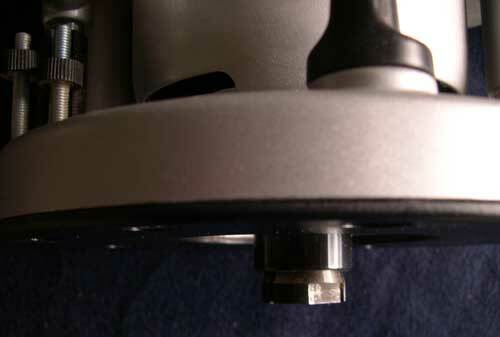 Below the speed wheel, the front brush replacement cap is also visible. At the business end, the collet is different from what I have been used to. Here is a view of it "head on." Here it is, removed from the router. It has very steep shoulders in line with the way it works. Here is the supplied wrench being used to fit a cutter. The wrench has a slight crank about ¾ along the handle. Note the position of the wrench with the collet loose enough to accept a cutter. Now note the position of the wrench with the collet fully tight. This short movement took me by surprise initially, as it felt unnatural after being used to winding my previous collet at least one complete turn. However, it works superbly and holds large panel-raising bits totally securely. This is the underside of the baseplate, showing the large and easy-to-use fence adjusters. The trammel (compass) plate is also visible at the right-hand end of its slot. 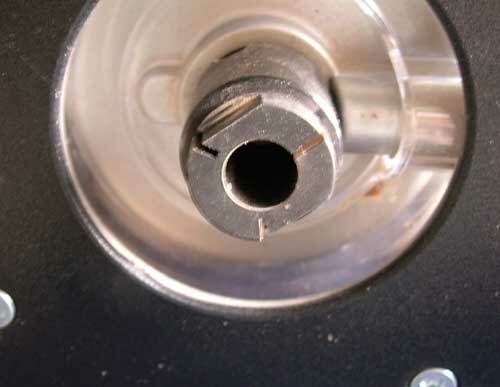 The baseplate is attached to the router by releasing two sprung-loaded mounting knobs in order to allow two pins to be located in the keyhole slots. This picture shows the pin depressed below the base, which can be left in position. Here is the base and fence fitted. It will fit with the "long" side to the right or to the left. 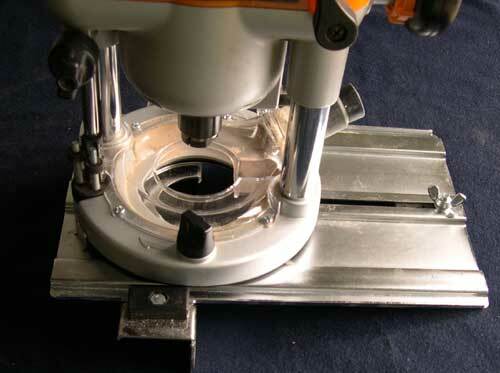 The advantage of fitting the "long" side to the right is that of greater stability on the workpiece and the ability to use the baseplate as an additional "handle" when edge routing, as shown here. 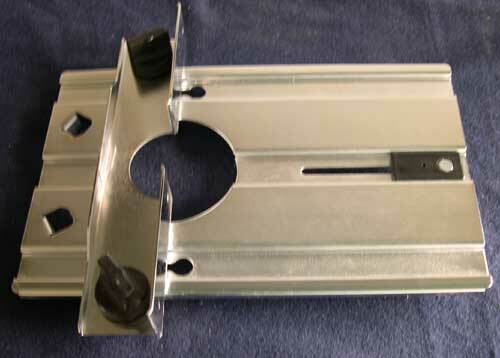 The trammel plate pivot mount has two pre-drilled pin holes to attach it to the workpiece. 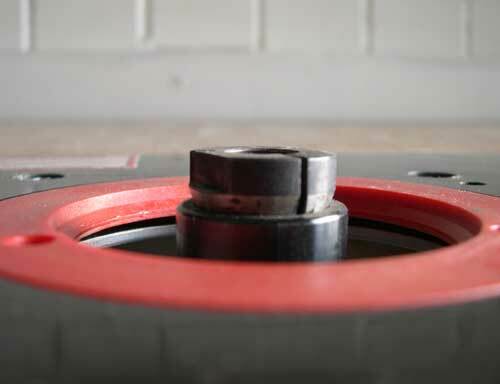 The recessed head bolt thread is then passed through the baseplate and the radius of the desired circle set with the wing nut. Apologies for the out-of-focus picture! The final picture shows the router mounted in a Rousseau insert and raised to fit a cutter. The ability to change bits above the table is a real bonus! In use, the router is powerful and stable. Whilst it obviously makes noise, it doesn't omit the same ear-ringing whine of some routers that I have used. The handles, plunge lock and on/off switch are comfortable and a pleasure to use. 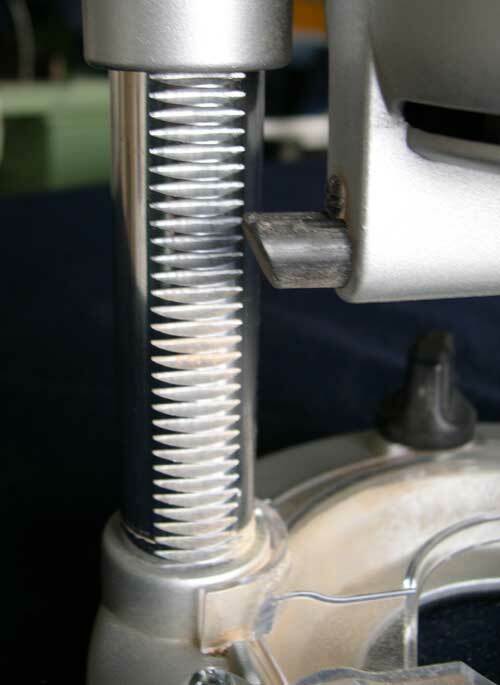 The rack and pinion plunge method is a winner, not only because micro-adjustment is available throughout the plunge range, but for under-table use (with the spring removed) it is so easy to operate. The depth stop turret is both ingenious and effective. Like most good ideas, it is simple and clear. The added safety features built into the on/off switch are impressive. Some, or even all, of these features may well be available individually on other routers, but I don't recall seeing them all in one package before. In the UK, the Triton is in the same price bracket as the Bosch GOF 2000CE, the DeWalt DW626 and the Makita 3612C. I believe that it represents good value for money and the quality of manufacture is obvious as soon as you handle the machine. I have no hesitation in thoroughly recommending this tool. All pictures taken by author with Nikon CoolPix 4300, except for the first two which are reproduced with thanks from Triton's Web Site.